A rich creamy cheesecake dessert your family and friends are sure to request again and again! 2. In a medium mixing bowl, combine the flour, walnuts and brown sugar. 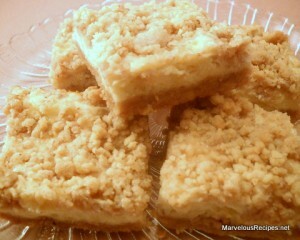 Add the melted butter or margarine, stirring until crumbly; reserve 1 cup of the crumb mixture. 3. Press the remaining crumb mixture over the bottom of a greased 8×8-inch baking pan. Bake for 12 to 15 minutes or until light brown. 4. In a medium mixer bowl, beat the cream cheese and sugar at high speed until light and fluffy. Add the egg, milk, lemon juice and vanilla; mix well. Spread evenly over the baked layer; sprinkle with the reserved 1 cup crumb mixture. Bake for 25 minutes. 5. Cool in the pan on a wire rack. Refrigerate and chill before serving. Cut into 2-inch squares. Makes 16 squares. This sure sounds wonderful! I’m putting it on my list to make soon! Wish I had some right now!